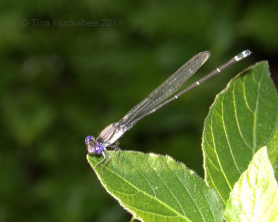 This entry was posted in Dusky Dancer, Eastern Tiger Swallowtail, Green Anole, Horsefly-like Carpenter Bee, Leaf-footed bugs, Pipevine Swallowtail, Southern Carpenter bee, Uncategorized, Virginia creeper Sphinx and tagged Biodiversity, Urban Wildlife, Wildlife Gardening by Tina. Bookmark the permalink. I know you had to be very patient to get those shots. I have had a Pipevine on my Dutchman’s Pipe, but no caterpillars. Yes, patience is a requirement, but it’s a quality I seem to be a bit short of recently. 🙂 Give it time, I imagine you’ll have some caterpillars and they’ll eat the Dutchman’s to the ground! No worries, though–it pops right back up. In the past, they have eaten the entire vine and kept it under control. I had to cut it back this year. I need nature’s helpers. Tina the photos are magnificent. All the animals that come out love me, they are divine. 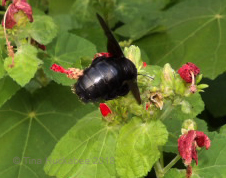 But the Southern Carpenter bee with its black color is a beauty. 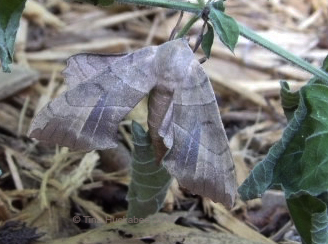 The photos of the emerging moth of Virginia Sphinx Creeper are fantastic and beautiful. Mr. Green Anole is my garden favorite. Happy Wednesday Wildlife! In my garden there are many different birds, butterflies, grasshoppers, spiders of different types, caterpillars, beetles from small to large with a large antlers, wasps, bees, flies, mosquitoes, lizards and more insects that I do not know how to call. Tina thank you very much for your blogs, I learn a lot with them. Have a nice week. Greetings from Margarita. Thank you, Margarita! 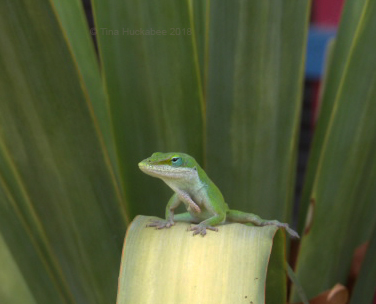 I love the Green anole too–they’re so cute! I’m glad you like my blog and gracias for reading. You have a nice week, too! Great photos! 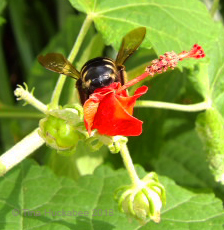 We have lots of those Carpenter bees in our garden too. They almost look too heavy to fly. Thanks for sharing. Haha! I hadn’t thought of them that way, but you’re right–those dainty wings carry a hefty bee! 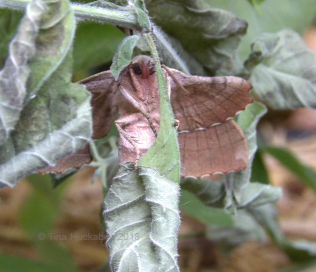 You have some fascinating visitors in your garden! I’m especially envious about the anole: We don’t have them here, and I love those little buddies! I’m always thrilled to see them when I travel south. I know you love the anoles, Beth. Well, who wouldn’t, they’re such cuties. I wish I could send some to you, but I don’t think they’d like your winters! Oooh, my favorite Tiger Swallowtail and I have seen so few this year. I always think I don’t have much for Wildlife Wednesday until I go through my photos. I have some standing meetings on Tuesdays and Wednesdays which means its often a challenge to finish up a wildlife post. Here’s my contribution for the last month. 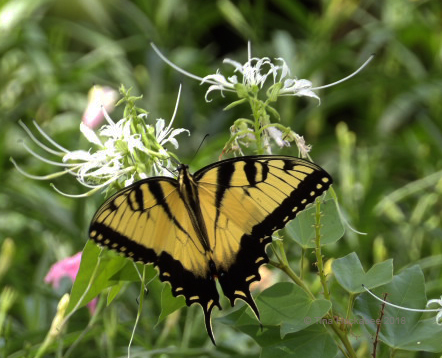 The Tiger Swallowtails really are just gorgeous. I’ve had a few this summer, along with some of the other big ones, though I’d say there haven’t been quite as many butterflies overall. Not worries on the postings, we do them when we can! I saw my first baby anole this week. I often see the babies of the black/brown lizards here, but the sight of a two-inch long green anole was a real treat. Between the heat and the rain, it’s been nearly a month since I’ve been out and about to see what was happening on the prairies and refuges. Now, they say there’s more rain for this weekend — I’m so ready for some nice, cool-ish (80s! ), dry weather. I do think I have a photo of a Southern Carpenter bee on a ladies’ tresses orchid. 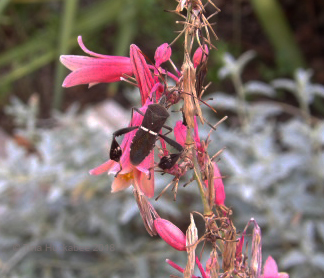 How such a big insect can cling to such a small flower is a bit of an amazement, but when I read that they’re nectar robbers who sometimes just grab on an dbite through the flower — it makes sense of it. Isn’t it amazing how the butterflies can keep going, even with substantial wing damage? I’ve seen some that have lost nearly half their wing, but they keep on fluttering. Aren’t the baby anoles adorable? All those anole parts in a teeny-tiny package. 80’s sound wonderful! I know we’re supposed to get rain, and it’s not *quite* as hot as it was. I’ll take it! Those Carpenter bees are nectar stealers, but I do see them at the blooms, covered in pollen. I guess their bulky bodies aren’t too terribly heavy. 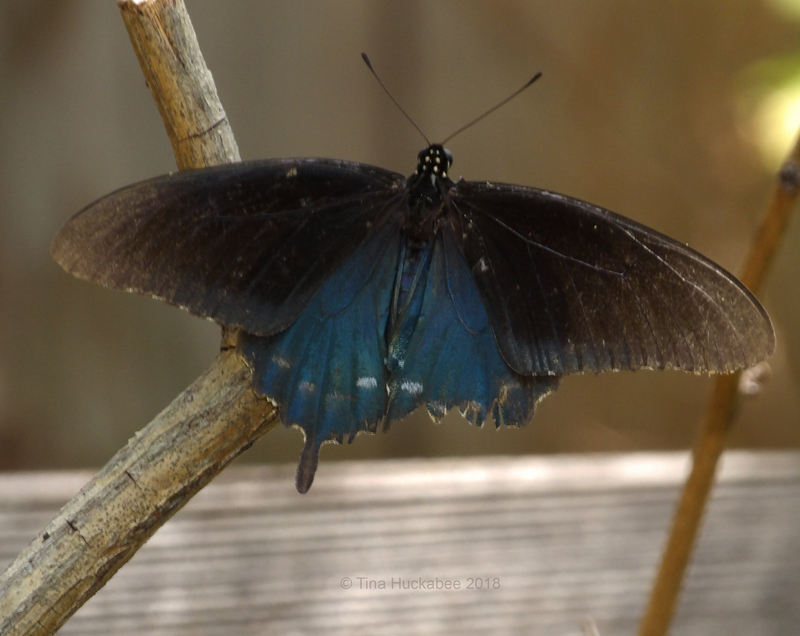 And it is amazing when butterflies have a chunk of wing gone and it doesn’t seem to hamper their flight, though I have seen some where the entire wing is so damage that they can’t get much height. It’s a sad sight. Gads! I was not expecting that dinosaur! What is that leave that he is on. I do not mean to change the subject, but it happens to look like a yucca. It is a yucca–Yucca recurvifolia. Oh, Yucca recurvifolia. That is perhaps the third most common yucca here. I agree. I’m always surprised when I see somthing like a Red Admiral photo on a European blog post, too. There are critter threads which connect us all. Oops! So similar here and there!!! Many more anole sightings over here lately. And a few solitary butterflies. Plus a rash of cicadas about two weeks ago that seem to have passed along. I haven’t seen many cicadas this year; last summer there were scads of them. Butterflies are always more common (at least around my garden) in the last part of summer and into autumn. Your lizard is very cool. 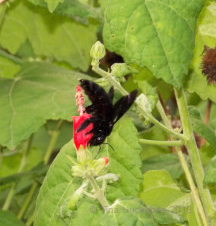 And I am jealous of the pipevine swallowtail. I’ve got a Dutchman’s Pipe vine, but haven’t seen any PV swallowtails to date. Nice little friends you have there.